Bright sun. Sweet warm air. Sunsets that stretch the evening. Is there any better pairing than that perfect summer day and a Blonde Ale in hand? At Craft Brewing Business, we don’t think so. That’s why blondes are our Beer of the Month. We sat down with two brewing pros — Bill Covaleski, president and brewmaster of Victory Brewing Co., and Matt Licklider, director of brewing for Widmer Brothers Brewing — to talk about their brewery’s finest and most desirable blonde ales. Victory not only defines its beer through its taste, but also through its labeling and packaging that is reminiscence of summer — portraying BBQs, baseball and beach goers on the packaging. Along with the “sublime, earthy familiarity” of the whole flower hops and the imported two-row German malts, Summer Love Ale also utilizes Victory’s proprietary American ale yeast. Covaleski believes this type of yeast gives the beer a clean fermentation character. All of the ingredients blended together provide the drinker with a surprising burst of lemony flavor. This lemony flavor is the perfect touch to a cold and refreshing beer on a hot day. Victory not only defines its beer through its taste, but labeling and packaging also goes a long way in building the blonde’s brand. Covaleski explained how Summer Love Ale is connected to the reminiscence of summer — portraying BBQs, baseball and beach goers on the packaging. However, the fun packaging isn’t the only reason this beer is getting customers talking. Summer Love Ale is a “flavorful beer that is easy to drink, yet satisfies fully,” Covaleski said. Thanks to Victory’s state-of-the-art German-built bottling system, which can fill roughly three 12-oz bottles per second, Summer Love Ale is available in bottles or on draft during the months of May through September. Victory brewed more than 8,000 barrels (bbls) of its Blonde Ale last summer. While Summer Love Ale brings in the warm weather on the east coast, Portland’s own 250-barrel brewhouse — Widmer Brothers Brewing — starts a whirlwind relationship with its summertime fling, Citra Blonde Summer Brew, on the west coast. Every April, Widmer Brothers Brewing rekindles its romance with Citra Blonde Summer Brew to spend four glorious months together. Citra Blonde’s flavors of fruity and bitterness are topped off with Widmer Brothers’ use of its house ale yeast. As a fan favorite, Widmer Brothers will brew around 6,000 bbls of Citra Blonde for this summer season. “Citra Blonde Summer Brew’s striking citrus aroma against the soft malt notes make for a well-balanced, refreshing brew that is perfect for the summer months. At 4.3 percent, Citra Blonde is a smooth, sessionable beer that’s full in flavor,” said Matt Licklider, director of brewing. Citra Blonde made its debut in 2011, spawning from Widmer Brothers use of the experimental X-114 hop, which has since been renamed “Citra.” “Citra is of course wildly popular now, but we like to believe we helped usher in its full production and popularity with our help in the developmental stage of X-114,” Licklider explained. Citra Blonde is crafted using Pale and Caramel 10L, giving the beer a light to moderate mouthfeel and a soft-malt presence, according to Licklider. Along with this, the brewery uses its proprietary Alchemy hop blend for the bittering effect and blends it together with the fruit aroma and flavor of Citra. Citra Blonde’s flavors of fruity and bitterness are topped off with Widmer Brothers use of its house ale yeast. Licklider clarified that this type of yeast gives the beer excellent head and lacing, providing the drinker with a clean, crisp and somewhat dry finish. 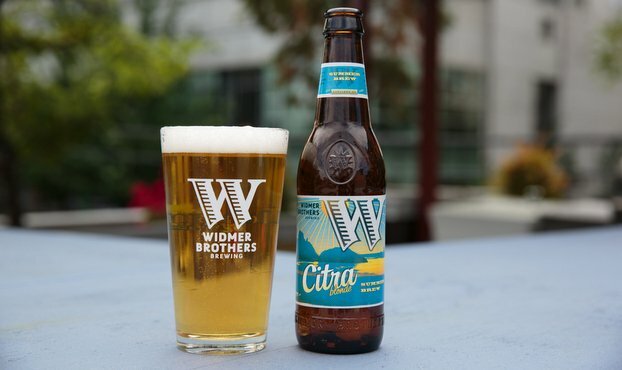 Now as a favorite, Widmer Brothers will brew around 6,000 bbls of Citra Blonde for this summer season. Each of these summer specials have been presented with many awards, making them highly recognizable in the beer community. Summer Love Ale, for example, was named the Best in Philly in 2011 and ranked third on the Ten Best Seasonal Beers in Complex Magazine. This year, it was mentioned in both Dallas and New York’s Thrillist’s list of Best Summer Beers. It was also ranked number one in Paste Magazine’s 16 Summer Beers Ranked. Citra Blonde has also received respectable awards as it won Silver at the 2012 North American Beer Awards and was ranked number two in The Huffington Post’s Best Summer Beers in a blind taste test. A small batch Blonde Ale brewed by Widmer Brothers also won Gold at the GABF hosted in 2003. In order to obtain this type of recognition, both of these award-winning craft beers entail a perfect blend of hops and malts, as mentioned previously. Blonde Ales are becoming more and more common as breweries are catching on to the trend of a light summer ale. However, Licklider believes this style of beer has not yet reached its full potential. In order to help summer ales stand out above the rest, Licklider suggested adding more flavorful hops. “The trick is finding the right mix of malt to balance out the flavor profile and not let the hops dominate,” he said. Widmer Brothers Brewing does just that in its Citra Blonde brew. “We think that to the general beer drinking public, Blonde Ales need something interesting about them to grab the consumers’ attention, and Citra is what helps this beer stand out,” he said. Widmer Brothers positions its Blonde Ale as a go-to offering for summer months, since it is strictly a seasonal beer. With the success of Summer Love Ale and Citra Blonde booming, breweries should take into consideration the establishment of their own summer seasonal brew. “Blonde Ales are generally light-to-medium bodied and relatively low in ABV,” making them ideal for warm weather, Licklider said. It’s no wonder that Summer Love Ale and Citra Blonde Summer Brew help craft beer drinkers say goodbye to bad weather and hello to surf, sun and sand. Do blonds have more fun? Our friends at Victory and Widmer on some summer seasonals! Good read!